There was no shortage of mice cartoon characters in the 50’s. Mickey Mouse, Marmaduke Mouse, Minute Mouse, Atomic Mouse, Danger Mouse, Supermouse (“The big cheese”), Mouse Musketeers – to name just a few. 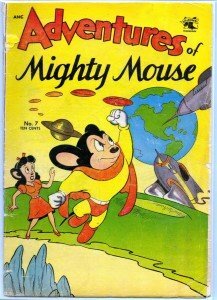 The Mighty Mouse anthropomorphic funny animal was created as a direct Superman spoof by the Terrytoons studio, releasing it as an animated short for 20th Century Fox. The character made its first appearance in 1942 and was followed by 80 more theatrical films between 1942 and 1961. One, “Gypsy Life,” released August 1945, actually received an Oscar nomination. Studio boss Paul Terry sold Terrytoons to CBS in 1955 and it used the films as Saturday morning television filler from 1955 through 1967. In addition, there were a number of St. John’s one-offs and of course, Terry-Toons Comics as well. 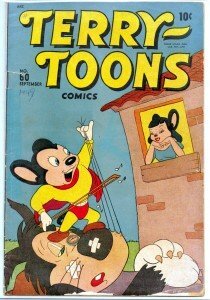 Pictured on right is Marvel’s Terry-Toons #42 from March 1946 (I love that cover!) as well as #60* from St. John (issue number picked up from Marvel #59) . Aside from nemesis Oil Can Harry, other characters included Mighty Mouse’s gal pals and objects of rescue – Pearl Pureheart (blonde) and Mitzi Mouse (brunette). 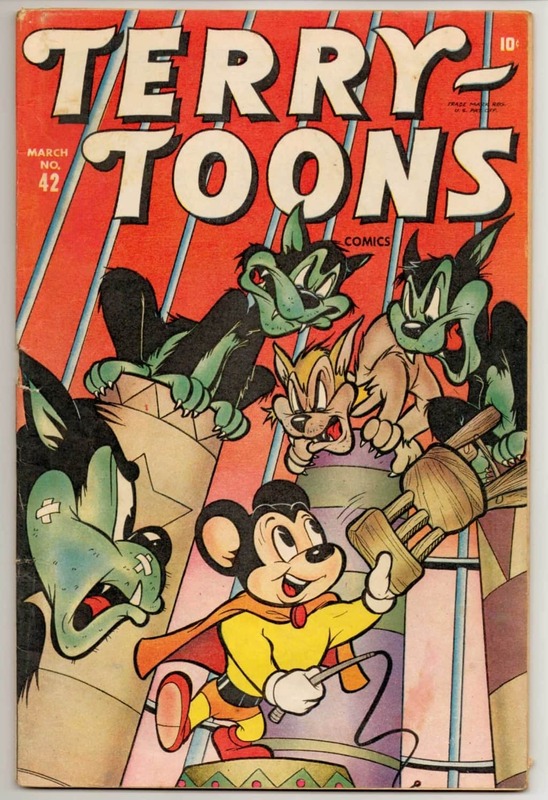 During Mighty Mouse’s stints at St John, art work is most associated with animator Art Bartsch. 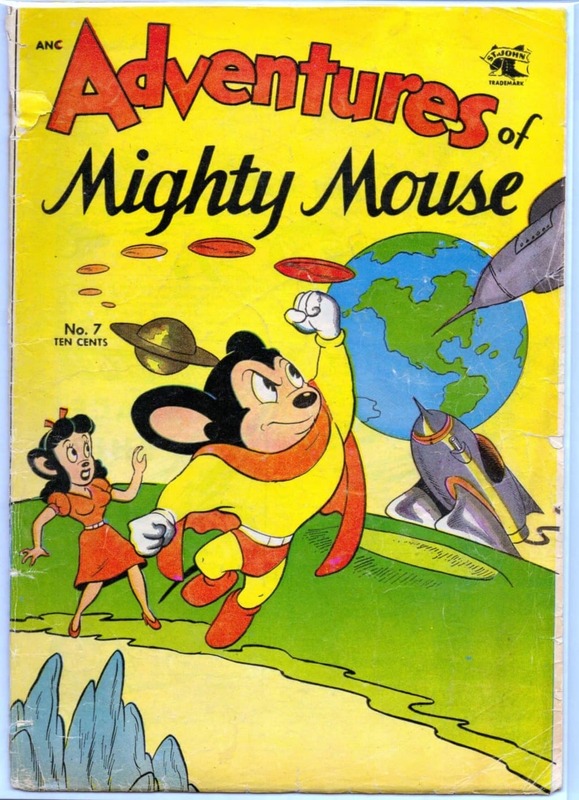 The cover at the top of this post is Adventures of Mighty Mouse #7*, St. John Publications September 1953. 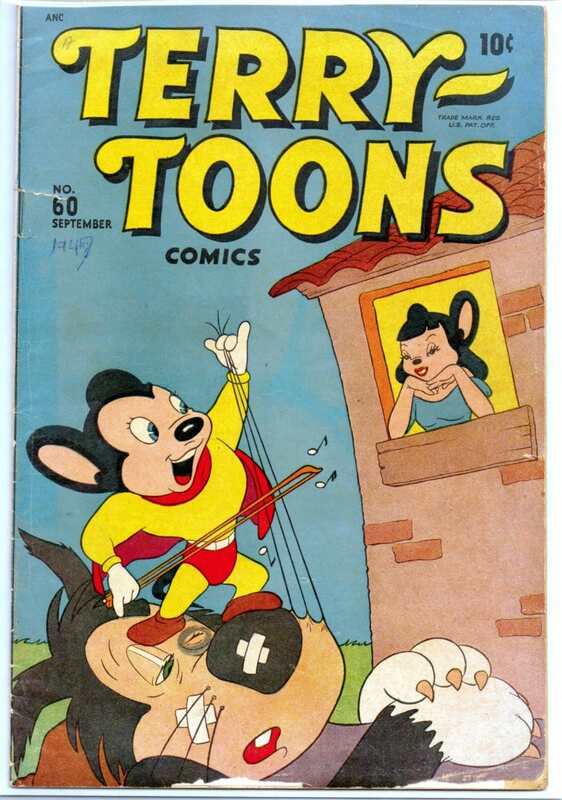 It has a wonderful science fiction tie in, with Mighty Mouse defending Mitzi from flying saucers and intergalactic invaders.